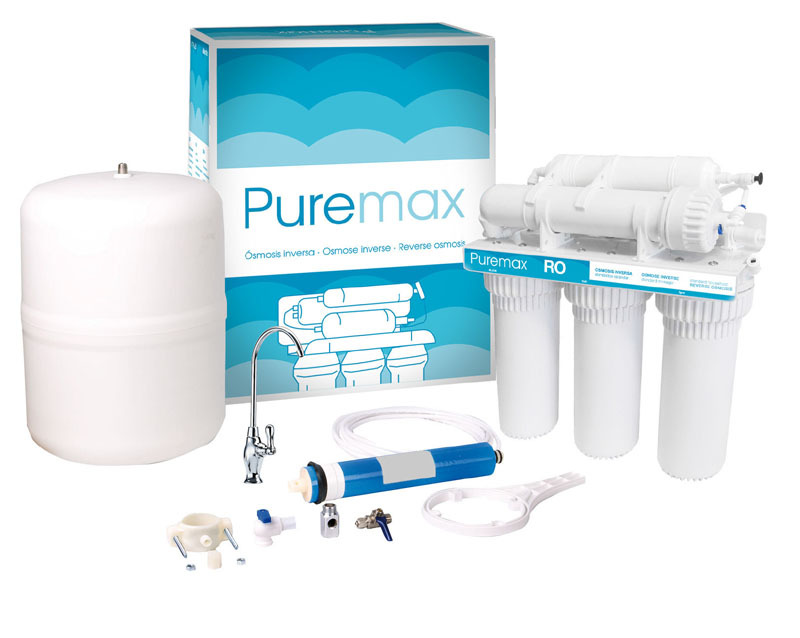 At Q-Water we have an extensive range of drinking water purification systems to suit your requirements and budget. From simple filtration systems to complete reverse osmosis systems. 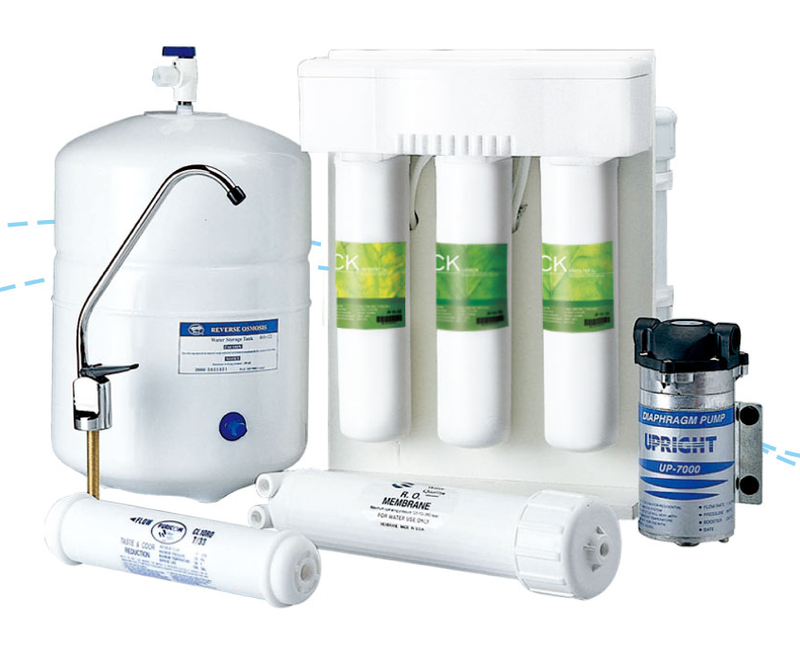 The CK 5 Stage Reverse Osmosis System is our most popular system that uses the latest Reverse Osmosis technology. It is the best value for money system available today. Post Carbon Filter to remove any remaining odours. Booster Pump system available for low pressure supply water. 12 Litre water storage tank. Quick fit filters that ensure the system stays contamination free throughout its life. UV Lamps – Normally fitted as a 6th stage to above system to remove bacteria. 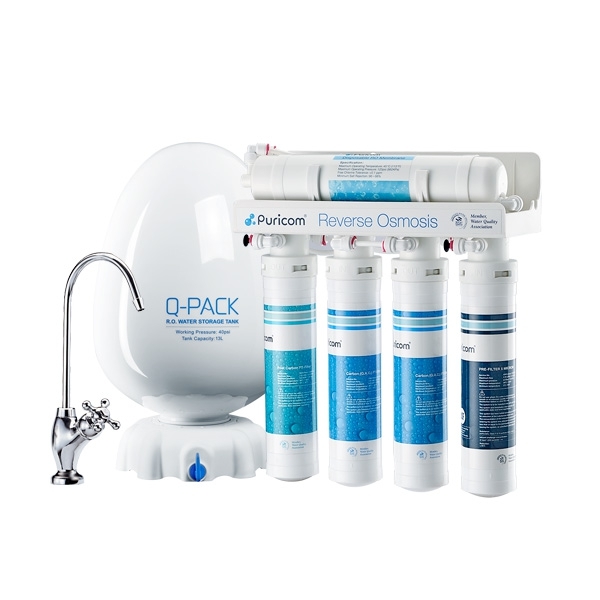 5 stage Reverse Osmosis systems without the booster pump. Optionnaly the 5 stage reverse osmosis system becomes a 6 stage system in adding a remineralizer filter, pH increaser. Reverse Osmosis is a separation process that uses pressure to force a solution through a membrane that retains the solute on one side and allows the pure solvent to pass to the other side. Reverse Osmosis removes contaminants present in the water supply, such as lead, mercury, copper, arsenic, iron, rust, algae, chlorine, atrazine and cadmium. The membrane used for reverse osmosis is semi permeable, meaning it allows the passage of solvent but not of solute. This process requires that a high pressure be exerted on the high concentration side of the membrane. This process is best known for its use in desalination (removing the salt from sea water to get fresh water), but it has also been used to purify fresh water for medical, industrial and domestic applications since the early 1970s. A sediment filter to trap particles including rust and calcium carbonate. An activated carbon filter to trap organic chemicals and chlorine. A reverse osmosis (RO) filter which is a thin film composite membrane (TFM or TFC). A second carbon filter to capture those chemicals not removed by the RO membrane. Optionally a UV (ultra-violet) lamp is used as a final disinfection method. We stock an extensive range of Commercial Reverse Osmosis Water Purification Systems to suit your requirements.